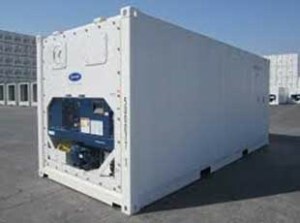 Portable Refrigeration containers provide an excellent solution for many cold storage problems. When walk-in coolers and freezers go down due to mechanical failure, immediate delivery of a mobile refrigeration or mobile freezer container can save product that would otherwise be lost. 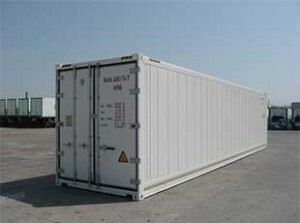 Moon Mini’s LLC rents 20 ft and 40 ft ground level for dock level refrigerated containers on a monthly basis. We deliver the temporary cold storage units to your location. If your business is expanding and you have outgrown your available refrigerated square footage, our mobile “reefer” containers can provide your business with valuable extra cold storage square footage to accommodate your requirements. It may be your increase in demand is temporary; therefore, your freezer rental or refrigeration rental requirements are short term. Mobile Refrigeration by Moon Mini’s may be the perfect solution! 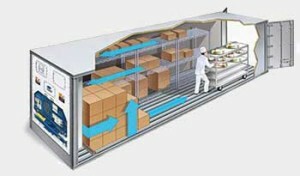 A temporary need for cold storage can arise due to seasonal demands. During holiday seasons, food distributors and grocery store freezers and coolers can reach capacity while demand for product exceeds cold storage space available. Moon Mini’s can deliver portable scold storage to your location when you want it and where you want it. 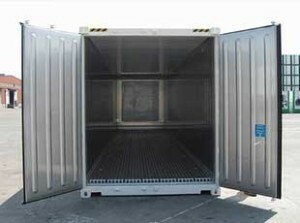 Our refrigerated containers are versatile in that they can be dock level or ground level. When your requirement is for dock level refrigeration, the containers are delivered on a chassis and positioned similar to a refrigerated semi trailer. When you require that the temporary cold storage unit be at ground level, we deliver the units on a roll-off truck or trailer and they are placed to maximize convenient access. Moon Mini’s mobile 20 ft and 40 ft refrigerated containers are powered by electricity. 3 Phase, 230/460 voltage is required. Our portable refrigerated containers are equipped with Carrier brand refrigeration units. The units, equipped with scroll compressors, offer the latest generation technology and provide the quietest and most efficient choice available. The cost of running diesel powered, refrigerated semi trailers vs. our electric powered is much higher. What’s So Great About Go Mini’s Louisville Portable Storage Containers?